Send your friends, family, and/or colleagues a good fortune with today's Save. Pay $20 for 150 custom message cookies or $10 for two giant custom cookies from KC Fortune Cookie Factory. If you have a long list of lucky recipients, choose 150 traditional restaurant-style fortune cookies with up to 15 different messages. 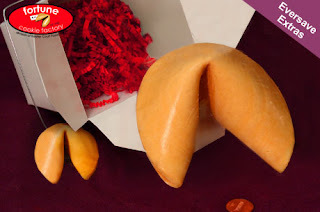 For those looking to make a big impression, select two giant fortune cookies delivered fresh in a Chinese take-out box. Customize messages with text and images, or choose from hundreds of traditional words of wisdom in the Confucious Message Database. This makes a unique party favor, engagement idea, or gift!